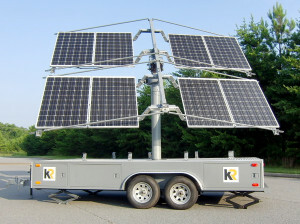 The KR Mobile Power Station is a portable solar powered generator that can provide clean and quiet electricity for a variety of situations. 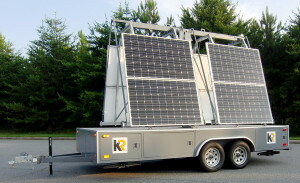 Using a (PV) photovoltaic array mounted on a rugged trailer with a state-of-the art battery storage system, the KR Mobile Power Station is unlike any other solar trailer. Events (fairs, festivals, clean up days, etc. Trailer sizes: 10 ft., 16 ft., and 22 ft.
Energy storage from 10 kW/hrs up to 100 kW/hrs.